I only have a Nikon D7000 that I use with an older, manual Nikkor 50mm f/1.8 lens that seems to work well for my SOTD pics. I also have an older Nikkor 200mm f/1.4 macro lens, but I don't have a tripod, so I don't use it often. Well, I'm looking positively amateur with just an EOS SL1. My secret weapon is the EF 100mm/2.8 macro lens. The other weapon is lighting. Lots and lots and lots of lighting. Room to work helps a lot. And since I can't afford studio strobes, the third weapon is a tripod. Any one will do. 2 second shutter timer. 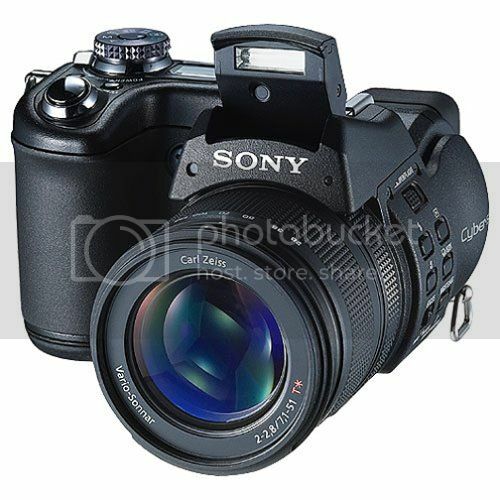 I'm using a Sony DSC F828 that I bought new MANY years ago. This is a pic of the camera, though not my camera. I'd like to have another for when this one poops itself. 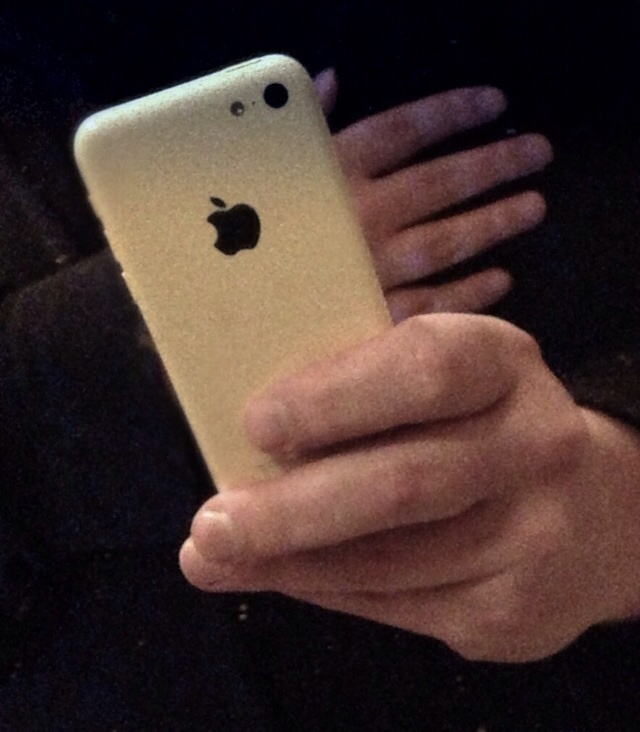 It like the little camera. Plus I have all sorts of add-ons for it. (02-19-2014, 01:31 AM)jungleisneutral Wrote: Nikon D70 Digital SLR - "bush camera" More than 10 years old, this one almost qualifies as "vintage" I will often take it on hiking trips using a special mount to secure it to the sternum strap of my rucksack, daypack or hydration pack. I'll typically use an 18-70mm as a good all round lens. Are you using the Capture Clip, something different, or something you created yourself? (02-19-2014, 07:00 PM)CRAusmus Wrote: Are you using the Capture Clip, something different, or something you created yourself? I looked at the capture clip and then disregarded it based on cost and complexity. When walking I keep the standard Nikon strap around my neck for security, so I just needed some type of "holster" to comfortably mount the camera to my sternum strap. I didn't need milspec, bomb-proof, drop-proof tech. My solution was an inexpensive ($7 each) plastic belt mount from eBay which fits my needs perfectly. In fact, I was so taken by them out-bush I ended up buying four of them in total. They work great on camera bag shoulder straps too. Do you have a link to the retailer, vendor...that you purchased from? I no longer have that Rolliecord IV in this image. (02-19-2014, 03:01 PM)jungleisneutral Wrote: I'd love to see your lighting set up sometime. The product photos you've posted have been excellent. I just use a light tent with four cfl lights. Two on top, two on the sides. Not much directional choice, but try to blow out the background as much as possible to reduce post production. Tripod + long exposure + final white balance correction in PS = new product shots. The new camera & lens really ups the game. The new camera added more control over my exposure & WB settings. The lens is the real star. (02-23-2014, 01:32 PM)jungleisneutral Wrote: I did approximately 30km of hiking on the weekend, including cross-country bush-bashing through thick vegetation, waist deep water crossings, and the old D70 camera stayed where it was supposed to for the whole expedition. So next time you want to take a pic of yourself shaving with a straight razor next to a babbling brook in the middle of the wilderness, I'd recommend some sort of sternum strap mount to get your camera there. Nice. I did a Sedona trip. Couldn't get a good shot of Templeton Rock since I only brought my long zoom lens. Do you just throw a second lens in your pack? I'm going to have to start doing that. I'm kind of bummed that I had to use my cell to take the wide shot. Oh, Rob. 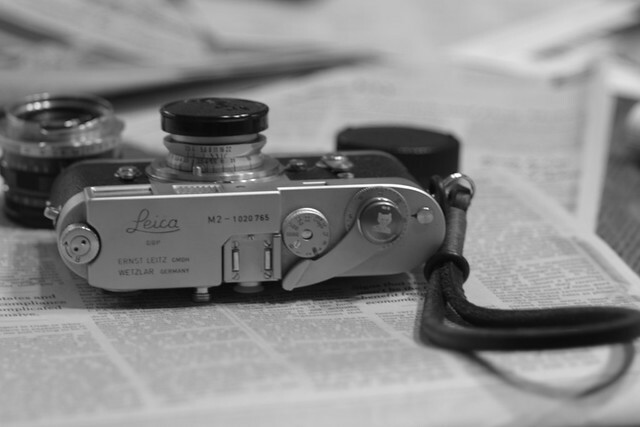 I would love to own a Leica! I'm 62 and it seems I've always had a camera since I was a young boy. I got heavily into photography in the 1970s through the 1990s, though I haven't done much lately. 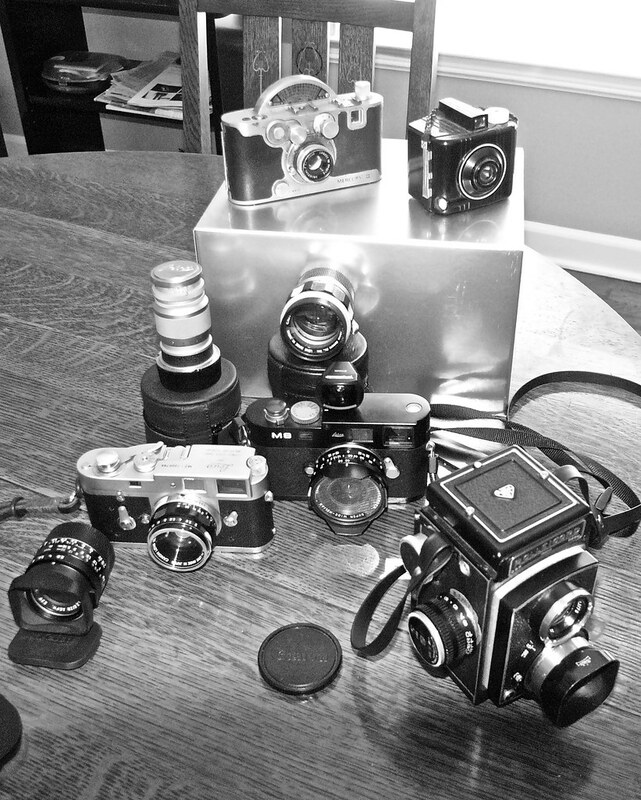 I have a closet full of manual-focus film cameras and I still haven't made the shift to digital. I am left-eyed and I wear glasses. Since the advent of 35mm autofocus SLRs and the stardardized grouping of button controls to the right of the finder (competing for space with the right lens of my glasses) I have had major ergonomic conflict with SLRs, and this has continued into digital. The new Fuji X-series digital cameras look like they might be a better fit for me, when and if I eventually go digital. I have extensive Bayonet 1 accessories that fit all of these TLRs. My favorite TLR is the Minolta Autocord CdS III, which has an outstanding semi-spot/zone meter on it. I don't bother to use the handheld meters with this one, as it just isn't necessary. 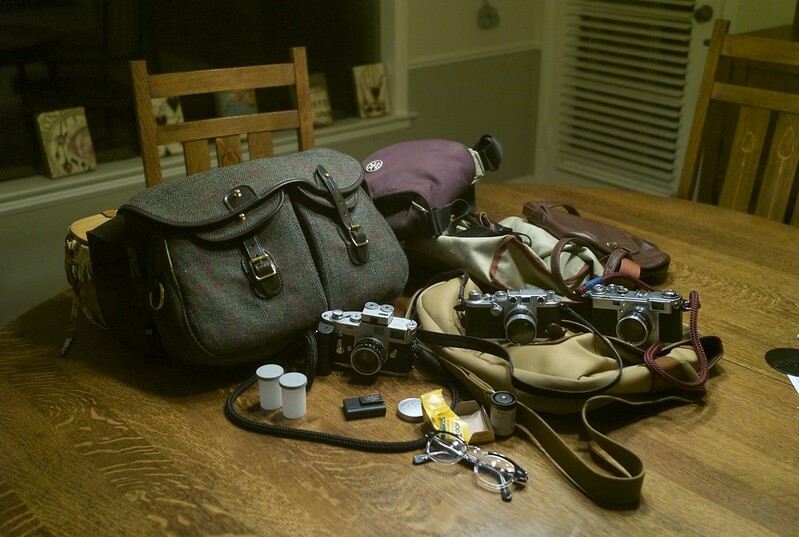 The Tessar-type lens on the Minoltas is at least as good as the Zeiss Tessar, itself, in terms of sharpness, contrast, and color fidelity. I had a Mamiya C330f TLR with the 80mm and 180mm lenses and numerous Mamiya accessories. I lent it to a cousin and it was damaged in an accident. My cousin swapped me his Mamiya RB67 outfit for it, but I miss the C330f. We now live in different states, but I hope to get the C330f back, get it repaired, and get damaged pieces (like the waist-level finder and a lens hood) replaced. I might also try to add a couple of lenses, such as the 55mm wide angle and the 135mm short tele. I mostly shoot professional slide film, so my modus operandi is to do all my work in-camera. I haven't done much photography for some time, but I'm trying to work up some new ideas and inspiration to get back into it. In the past, I have photographed whatever looked interesting around me, such as scenery, local wildlife that didn't require a long tele, some floral pics, and I did some window-light portraiture. I just discovered Rangefinderforum.com and I have been lurking a lot there. I'll probably join that forum at some point.